The threat that represented the NATO Hawk ground-to-air radar-guided missiles was taken very seriously by the Soviets. So much so that dedicated tactics (such as adapted tactical nuclear strikes) or equipment (such as the Mi-8SMV) had been developed for their neutralization. Also, the Soviet air-to-ground firing ranges usually included numerous models of Hawk. Laurent Schmitz was the control officer of a Belgian Hawk battery deployed on the frontline near the East German border. He reveals here through anecdotes and technical stories the operational reality of these dreaded weapons. November 9, 1989, shortly before midnight. 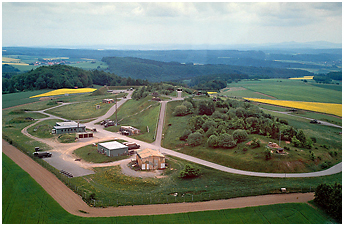 The night was cold and quiet at the Hawk missile site of Flechtdorf. In the ‘Ready Building’, the response team watched the video tape of the last James Bond movie. Despite the metal grids on the windows, electronic interferences distorted the image every three seconds demonstrating the proper functioning of the search radar. Suddenly, a sentry called the Battery Control Officer (BCO). "Lieutenant, something is going on. I hear explosions everywhere, it's like artillery fire"... At the same time, the warning sirens began to wail. Sprinting out of the buildings, men were rushing to their posts. Arriving at the top of the hill on which the radars were positioned, technicians hurriedly adorned their helmets and began with their check-lists. In the Battery Control Center (BCC), The BCO received an initial briefing from his deputy: "We received the code ‘Blazing Skies’, like for an exercise, but at the same time they ask us to be ready to go to ‘Battle Stations". Since the beginnings of the Hawk in Western Europe, from Norway to Turkey, no one ever went to ‘Battle Stations’. The difference between the two orders is that in wartime the ‘umbilicals’ of the missiles would be connected… In record time, the different positions reported to the BCO: "High Power Alpha is ready ... Bravo is ready, PAR is ready, CWAR is ready, Fire Section ready ..." The operator of the Alpha tracking radar, arrived the first in the BCC, after having activated the radar remote control unit. He took the seat at the firing console and made his report in a breathless voice: "From the top of the radar hill, we see rockets and fireworks across the horizon, and there is light everywhere, all the villages are illuminated. We also hear sirens and bells....” On the radio channel of the battalion, the duty officer offered no explanation and simply repeated "Standby, Standby...” In barely eight minutes, the Alpha battery was ready to fire. Already, operators scanned the East German border with their electromagnetic beams. But in the sky, all was calm. Beside the usual airliners and a pair of fighter aircraft, which turned away in the GDR, there was nothing to report. The big news came shortly after from the generator operator. The Master Corporal spoke German fluently. When the rumor reached him, he connected the television on ZDF channel and followed the news online ... "The wall has fallen! The Wall has fallen! They cross the border everywhere in Berlin, Kassel, everywhere!” This explained the sudden tension. The Allied Command feared a violent reaction of the communist power. But this evening just as the following nights, the MiG and Sukhoi aircraft remained quietly on the ground. For the staff of the Alpha battery, this unusual warning signaled the end of the Cold War, as well as the end of the Belgian Forces in Germany. In the late Eighties the battalions of the Belgian anti-aircraft artillery were organized into four entities, in addition to the logistics services: a command center, the BOC (Battalion Operations Center) and three missile batteries. Each battery was deployed on a site built specifically to accommodate all its combat equipment. In case of tension or alarm, the batteries would move to new known or improvised positions. Moving a battery lasted several hours and would normally be done every night to prevent a preemptive attack. The deployment of batteries went according to the principle of in depth fire support. 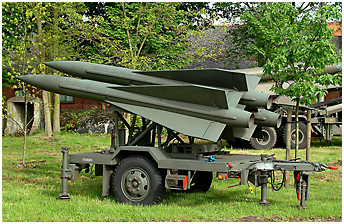 Each battery was integrated into a defense system including fighters and other anti-aircraft weapons like long-range Nike Hercules missiles, Gepard self-propelled canons and short-range missiles. A real defense barrier covered the eastern border of NATO, from Turkey to Norway. In peacetime, each of the three batteries of a battalion received a warning stage defined by the time necessary to be ready to fire. In ‘20 minutes’, the staff was on call on the site for 24 hours. The equipment was working and ready to fire as soon as possible. In ‘6 hours’, the staff was not allowed to leave the unit, but was working normal hours. The equipment could be disconnected. This was an opportunity to conduct maintenance of the radars and launchers. Major repairs to the battery were made during ‘12 hours’. In addition, some staff could take a leave and even return to Belgium. After a week, the battery on ‘20 minutes’ moved to ‘12 hours’. The latter would replace the one that was on ‘6 hours’, itself being replaced by the third battery. This procedure was not immutable and was running until the battery on ‘20 minutes’ was unable to ensure its mission following a failure of a radar for example. Then it was a challenge for the other units to take over the relay as soon as possible. In this way, in the worst case, a surprise attack in the Belgian sector would encounter at least one 100% operational battery. NATO UNCLASSIFIED Le contenu de cet article est basé sur des sources appartenant au domaine public et ne comporte aucun renseignement actuellement classifié. The content of this article is based on sources in the public domain and it contains no currently classified information.